The world's largest and longest-running song competition, the Eurovision Song Contest is a significant and extremely popular media event throughout the continent and abroad. The Contest is broadcast live in over 30 countries with over 100 million viewers annually. Established in 1956 as a televised spectacle to unify postwar Western Europe through music, the Contest features singers who represent a participating nation with a new popular song. Viewers vote by phone for their favourite performance, though they cannot vote for their own country's entry. This process alone reveals much about national identities and identifications, as voting patterns expose deep-seated alliances and animosities among participating countries. Here, an international group of scholars from a variety of disciplines, including musicology, communications, history, sociology, English and German studies, explore how the contest sheds light on issues of European politics, national and European identity, race, gender and sexuality, and the aesthetics of camp. For some countries, participation in Eurovision has been simultaneously an assertion of modernity and a claim to membership in Europe and the West. Eurovision is sometimes regarded as a low-brow camp spectacle of little aesthetic or intellectual value. The essays in this collection often contradict this assumption, demonstrating that the contest has actually been a significant force and forecaster for social, cultural and political transformations in postwar Europe. 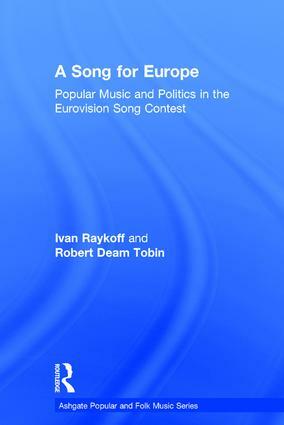 Contents: Introduction; Camping on the borders of Europe, Ivan Raykoff; Return to ethnicity: the cultural significance of musical change in the Eurovision Song Contest, Alf BjÃ¶rnberg; Eurovision at 50: post-wall and post stonewall, Robert Deam Tobin; Chanson, canzone, Schlager, and song: Switzerland's identity struggle in the Eurovision Song Contest, Michael Baumgartner; Chasing the 'magic formula' for success: Ralph Siegel and the Grand Prix Eurovision de la Chanson, Thorsten Hindrichs; Fernando, Filippo, and Milly: bringing blackness to the Eurovision stage, Lutgard Mutsaers; Finland, zero points: nationality, failure, and shame in the Finnish media, Mari Pajala; The socialist star: Yugoslavia, Cold War politics and the Eurovision Song Contest, Dean Vuletic; Lithuanian contests and European dreams, Bjorn Ingvoldstad; 'Russian body and soul': t.A.T.u. performs at Eurovision 2003, Dana Heller; Gay brotherhood: Israeli gay men and the Eurovision Song Contest, Dafna Lemish; Articulating the historical moment: Turkey, Europe, and Eurovision 2003, Thomas Solomon; 'Everyway that I can': auto-orientalism at Eurovision 2003, Matthew Gumpert; Idol thoughts: nationalism in the pan-Arab vocal competition Superstar, Katherine Meizel; 'Changing Japan, unchanging Japan': shifting visions of the red and white Song Contest, Shelley D. Brunt; Index.